"...Drawn by the region's abundant copper and turquoise deposits... the great turquoise veins of Serabit el-Khadem had been discovered...""
Archaeologists have found that the very earliest known settlers in the Sinai--they arrived about 8,000 years ago--were miners. Drawn by the region's abundant copper and turquoise deposits, these groups slowly worked their way southward, hopping from one deposit to the next. 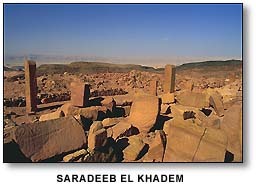 By 3500 BC, the great turquoise veins of Serabit el-Khadem had been discovered. At the same time, the kingdoms of Egypt became united under its first pharaohs, and these great rulers soon turned their eye eastward. By about 3000 BC the Egyptians had become masters of the Sinai mines, and at Serabit el-Khadem they set up a large and systematic operation. For the next two thousand years, great quantities of turquoise were carved from Serabit el-Khadem, carried down the Wadi Matalla to the garrisoned port at el-Markha (just south of Abu Zenima), and set aboard boats bound for Egypt. For the Egyptians, the brilliant blue-green stone served myriad purposes: scarabs were carved from it, and the bright mineral enamels of powdered turquoise were used to color everything from fine statuettes to bricks. To mine the turquoise, the Egyptians would hollow out large galleries in the mountains, carving at the entrance to each a representation of the reigning pharaoh--a symbol of the authority of the Egyptian state over the mine and its yield. Although many of the region's pharaonic reliefs were destroyed by a British attempt to re-open the mines in the mid-nineteenth century, the excellent bas relief of Pharaoh Sekhemkhet on the east face of Gebel Maghara survives. Also at Serabit el-Khadem are the ruins of a temple dedicated to Hathor, containing a large number of bas-reliefs and carved steles. Copyright (c) 1997 by interKnowledge. All rights reserved.